A poker tournament differentiates itself from a cash game in the fact that everyone has starts out with the same amount of chips. The way you fund a tournament is through a buy-in which usually attaches a tiny entry fee for the online poker room or casino to make money. The buy-in plus (+) the entry fee buys you a seat in the tournament, where each player receives the same number of chips to begin with. The fee can range from a very small amount such as 50 cents in an online poker room, or a large amount such as 10,000 dollars for the World Series of Poker. Most tournaments are structured so that once your chips are all gone you are out of the tournament. You can also choose to play in rebuy tourneys which allow you to buy more chips after you’ve gone out, up to a certain period of the game. Usually within the first hour or two of play or before the first tournament break. Add-ons are also common in rebuy tournaments. An add on is when you pay another amount, the same as the entry fee, and you get to add the starting amount of chips to your stack. There are also double add-ons. Of course rebuy and add-on tournament play is considerably less pure and more reckless and requires adjusting strategic approach to the tournament. Typically, the poker tourney betting structures (and blinds) start out with limits of $15-$30 or $25-$50. Betting limits increase from there regularly, usually every 30 minutes, 45 minutes, or hourly. The betting increase of a new round is often double the bet from the previous round. The prize pool in tournaments depends on the amount of the entry fee and the number of players. The larger the overall pool of money available for splitting, the more opportunities will exist for finishing in the money. Here is an example of a possible tournament payout structure with a $500 dollar buy in consisting of 200 players. A satellite tournament system allows players to play in huge tournaments such as a $100,000 prize pool for a tiny amount. Sometimes the amount is as low as 50 cents to buy-in in some online poker rooms. The satellite is essentially a many tournament that when you place at a certain level you move on two the next satellite consisting of winners of other first satellites. For example, you could place in a satellite, move on to another satellite, place in it, and win a seat in a standard tournament with a big prize pool. This is a great way for players to get to big tournaments with little monetary investment. Of course, takes a lot more time. Sit and Go tournaments are quick, convenient, fun tournament structures that Aintluck.com recommends as one of the top ways to make money playing online. The structure of a sit and go is much like that of a home game tournament with your friends. 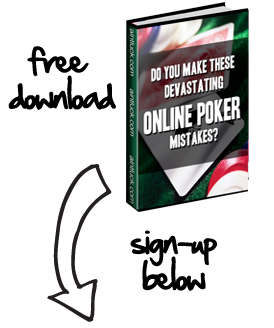 Sit and Go’s can usually range from single to 3 table set-ups and are offered at all of the best online poker rooms.